The lymphatic system is one of the most important but often neglected systems operating in the body. Most of the problems in the human body start due to the vitiation of lymphatic system. The lymphatic system is vital to our health and very life. Part of our immune system, it provides defense against disease-causing organisms. When the lymphatic system becomes sluggish our tissues become congested, organ function is impaired and our health suffers. A healthy lymphatic system will help reverse insulin resistance (type 2 diabetes), will help maintain optimum blood pressure levels, keep the heart healthy, keep the liver and kidney safe, help good skin and hairs and keep away baldness and aging, keep arthritis at away. It also keeps you safe from different types of tumors and cancer. It helps with the glandular system and maintain hormonal balance in the body. It won’t allow virus, bacteria and other disease producing microorganisms to flourish and thus keep you healthy. Here we will explain what this system is, how it works, and how to keep ours healthy. Each and every cell of our body is surrounded by a fluid called interstitial fluid. 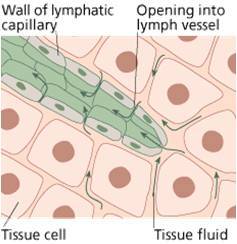 At the cellular level, the lymphatic system is a pathway through which fluid flows from the inter cellular spaces into the blood. The interstitial fluid surrounding the cells drains into a small tube like structure (shown in green in the picture). The lymphatic system is made up of ducts, nodes, and organs that circulate a clear, watery fluid called 'lymph' throughout the body. The primary purpose of this fluid is to filter or flush out waste products such as toxins and pathogens. Lymph also distributes immune cells, fats and proteins and importantly, produces immune system cells called lymphocytes which protect our bodies from antigens such as viruses and bacteria. Lymph works with the circulatory system to drain fluid from cells and tissues and is the key factor in maintaining a healthy fluid balance. Its main components are located in the bone marrow, lymph nodes, spleen, thymus gland and tonsils. Lymphatic tissue can also be found in the liver, heart, lungs, and skin. Lymphocytes are formed in the bone marrow, while lymph nodes, small bean shaped filtering structures, are found in the armpit, back of the head, behind the ears, groin, neck, under the jaw, and chin. The lymph fluid moves through the body via channels or 'vessels' that are fitted with one way valves, so lymph always moves in one direction. The lymphatic system is very much similar to the drainage system of our city and in fact it is the drainage system of the human body. 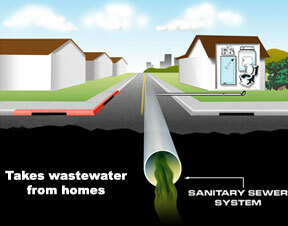 Like a drainage system from each house collect into bigger drainage pipes, the fluid from small tubes drain into bigger collecting tubes or lymph capillaries. Lymph capillaries turn into lymph vessels which pass through lymph nodes, empty into the lymphatic ducts and then into the venous system. The venous system carries the impure blood to the heart. The pure blood is given in red and the impure venous blood in blue and the lymph in green. The lymphatic system includes lymph, lymphocytes, lymph vessels, lymph nodules, lymph nodes, tonsils, spleen and thymus gland. Part of the body’s defense system, the lymph nodes filter lymph and the spleen filters blood, removing microorganisms and other foreign substances. The lymph nodes act as a filtration system that keeps particulate matter such as bacteria from entering the bloodstream. They produce both lymphocytes and monocytes. Lymph tissue contains lymphocytes and other cells that can destroy microorganisms and foreign substances. 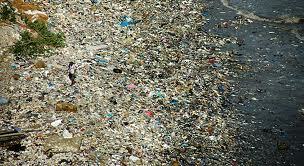 The cells have obtained oxygen and nutrients for its survival and also throw the waste products into this river of water. These waste products if not removed becomes toxic for the cell. Any stagnant water is unhealthy and so imagine cells surrounded by stagnant fluids around them. A city in a country can be clean only if surroundings of each house are kept clean. This means there should be and efficient and regular means of garbage disposal system in operation. Similarly a body can be clean and healthy only if the fluid surrounding each cell is kept clean by regular garbage disposal system. If cells dump waste every second but if the waste is not cleared, your interstitial fluid will look like the pictures shown below. The lymphatic system helps maintain fluid balance in the tissues. It also helps in clearance of proteins and large particles which are too large to be absorbed into the blood capillaries, but can be carried through the lymphatics. Removal of proteins from the intercellular spaces is so important, that if were not done, we would die within about twenty-four hours. 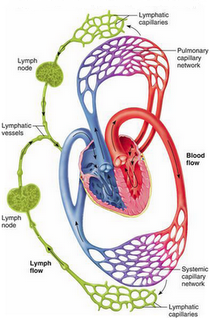 Lymphatic fluid is derived from intercellular fluid that flows into the lymphatics. About two-thirds of lymph is normally derived from the liver and intestines. Small lymph capillaries originate in the tissue and carry fluid away from the tissues. These lymph capillaries, which are in almost all tissues of the body, except the bones, superficial skin, deeper portion of peripheral nerves, the central nervous system, endomysium of muscles. But even these are able to drain through minute pre-lymphatic channels, whose fluid then flows into the lymphatic vessels. The brain is unique in that the pre-lymphatic channels drain into the cerebrospinal fluid and from there directly into the venous system. The liver is very permeable to fluids and this flow freely into the liver’s lymphatic system. The liver is an expanding and contracting reservoir of blood, lymph and bile. If circulation is weak, these fluids will have a tendency to congest the liver. What can i do to keep my lymphatic system healthy? During periods of rest, lymph is sluggish. During exercise the lymphatic pump becomes very active. Exercise can increase lymph flow ten to thirty fold. Thus, regular exercise is the most important factor in keeping a healthy lymph flow. Why is exercising healthy? Medical Researchers and Doctors advocate exercise, but many do not understand its real benefit. For example, they know that exercise and estrogen levels in women are related. There is lot of research evidence showing that exercise prevent heart diseases, cancers, diabetes and various other diseases. In short medical research shows that poor exercise is one of the major contributor of many diseases and hence they recommend physical exercise. This is also true but there is much more to it. Exercise increases blood flow, which removes all the wastes from that region and supplies nourishment. They increase blood circulation, heat circulation, air circulation and energy circulation. More important is that it facilitates lymphatic circulation. Poor body movements mean poor lymphatic circulation and so poor immunity. We have already seen that body movements and deep breathing helps in lymphatic circulation. Deep breathing can happen only when you have awareness of yourself. And that’s the reason why yoga has been so useful in many diseases and recommended by many doctors of different system of medicine. Beside this Nature has given us many herbs which help in cleansing of the interstitial fluid and the whole lymphatic system. The proper use of these natural supplements keeps the body healthy. Nature has given us many herbs which help in cleansing of the interstitial fluid and the whole lymphatic system. The proper use of these natural supplements expel the foreign matter and keeps the body healthy. This process was well known to the ancient doctors so they had devised different kind of massage with different herbal combinations to accelerate the circulation of lymph in the body to remove the toxins and pathogens to heal it. At NATURAL CARE it has been our consistent approach to purify the blood and the lymph of all the patients so that they get long lasting results. And working on the same philosophy we have achieved excellent results in different disease/disorders which are said to be incurable in other systems of medicines.